Lucy Hawking and Curved House Kids today launch Mars Diary, an ambitious new primary science programme, in partnership with the UK Space Agency, that aims to get 60,000 British schoolchildren involved in the UK’s ExoMars mission and other human and robotic space endeavours. 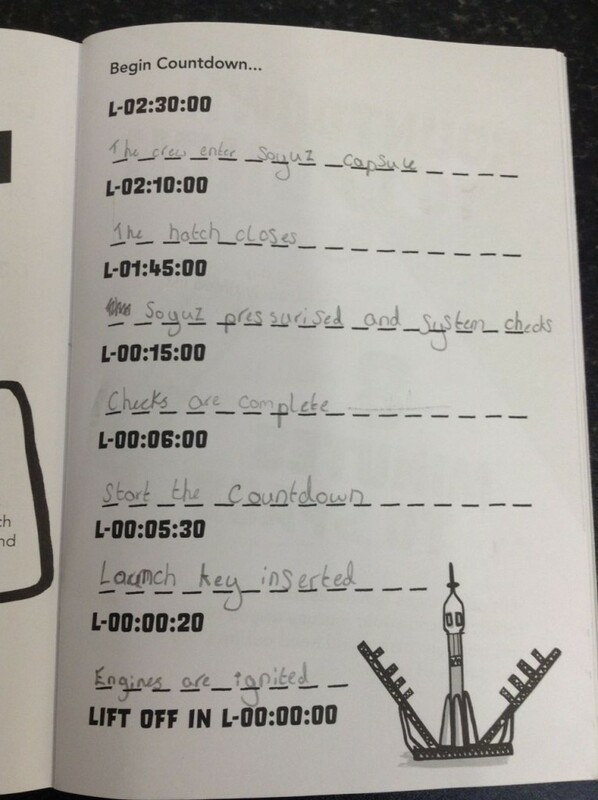 At the core of the Mars Diary programme is an illustrated activity book that students personalise as they complete a range of creative, empowering STEM activities. Teachers are supported with lesson plans, teaching notes, differentiation ideas, multimedia and detailed curriculum links for England, Scotland, Wales and Northern Ireland. 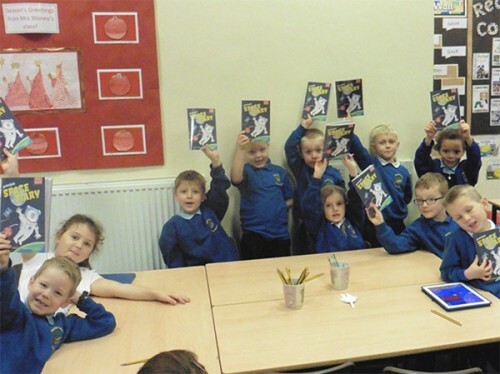 With the support of the UK Space Agency, 15,000 free Mars Diary books will be made available to primary schools across the UK with priority given to those in areas of high levels of deprivation and education under-achievement. Five thousand of these will be distributed to teachers via ESERO-UK and STEM Learning. To ensure full access to these high-quality materials, all UK primary schools will also have free online access to the entire programme including over 60 hours of lessons for Key Stage 2 (P4-7 / Y3-6). 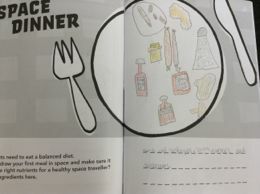 The Mars Diary has been written and developed by Lucy Hawking and Curved House Kids with a strong emphasis on creativity and visual learning. Students will be inspired by real space, STEM and education experts including Sue Horne and Libby Jackson from the UK Space Agency Exploration team, volcanologist Professor Tamsin Mather, Mars weather expert Professor Stephen Lewis, Pamela Burnard, Professor of Arts, Creativities and Education at the University of Cambridge and robotics expert Professor Peter McOwan at Queen Mary University of London. 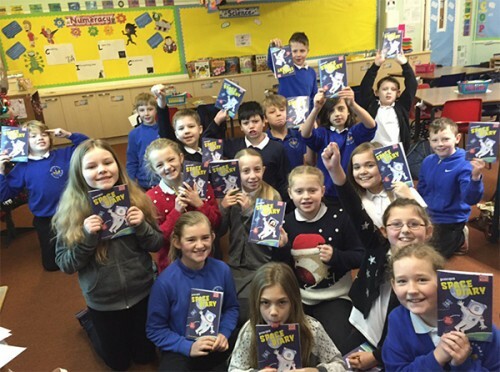 From today (Thursday 22nd February) primary schools in the UK are invited to register at marsdiary.org for a chance to receive a free box of 30 Mars Diaries plus stickers and a Mission Log poster for their class. Books will be allocated to schools on a first come, first served basis with priority given to those who have a high percentage of free school meals. 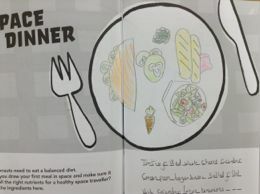 Other schools, home educating families and community groups can also register to access the free online programme, or purchase copies of the printed diaries via the online bookshop at marsdiary.org. Books will be delivered late-March. 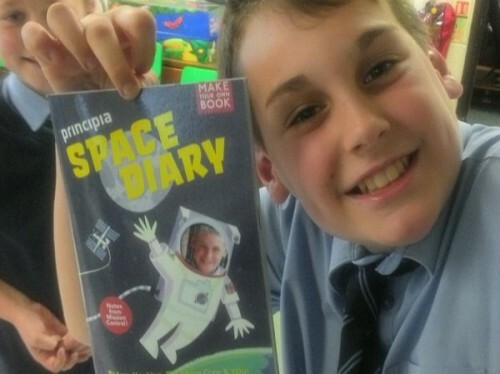 If the popularity of the Principia Space Diary is any indication, schools are encouraged to register fast to avoid missing out on printed books. 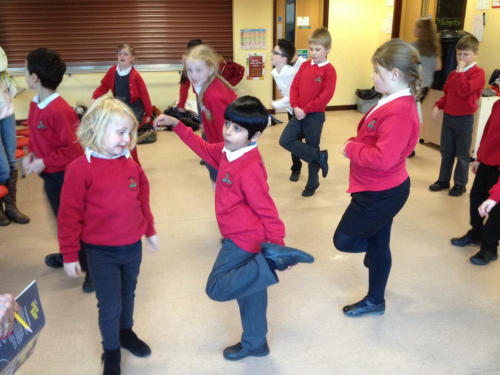 The programme is fully supported, flexible and can be completed at any time during the school year. Particular emphasis has been placed on making the complex topic of space science easy for any teacher to confidently deliver, giving them the tools to inspire children to read, write, draw, research, experiment and problem solve while strengthening STEM, literacy and visual literacy learning. The multi-modal approach to learning means students use a wide range of analogue and digital media to complete their tasks: from videos, tablets and phones to images and audio. The Mars Diary programme is funded by the UK Space Agency, as part of a scheme to support education outreach associated with the ExoMars mission, which is sending a rover to Mars in 2020 to look for evidence of life on The Red Planet. Registrations open Thursday 22nd February and successful schools will receive books at the end of March 2018. Lucy Hawking is a British author who writes adventure stories based on science for a primary school age audience. 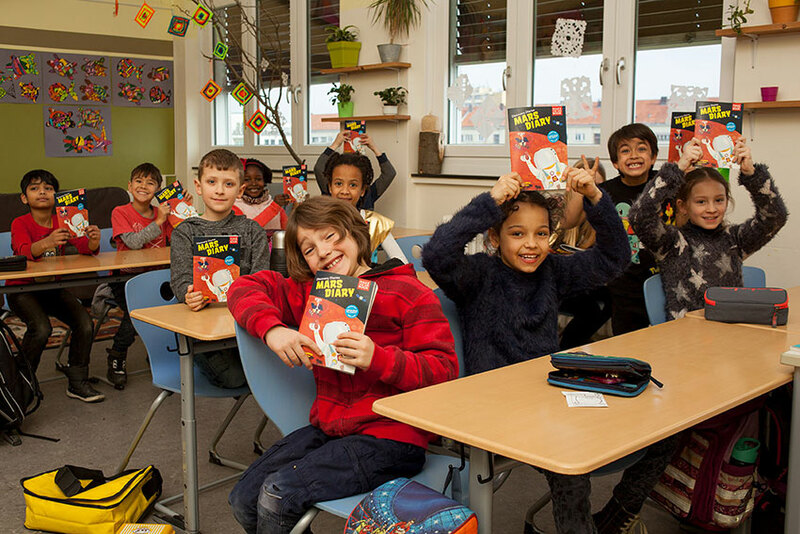 Featuring a boy called George and his best friend Annie who have exciting space adventures together, the George series combines storytelling with science, and gives young readers an entertaining introduction to the world of space exploration. The series is published in over 40 languages. An Oxford graduate, Lucy started her writing career in journalism and worked for British newspapers, radio and magazines before becoming a published author. Lucy has been recognised for her work in science and education with several awards – she won the Sappio Prize for Popularizing Science in Rome 2008 and the UNSW medal 2015 for Science Communication and was awarded a doctorate in science by Queen Mary University of London in July 2015. Lucy is a trustee of the Autism Research Foundation, supporting scientific research into the condition of autism. Curved House Kids has a simple mission: to improve education by creating books and learning materials that engage children the way children are engaging with the world. This means visually, interactively and with tools that empower. 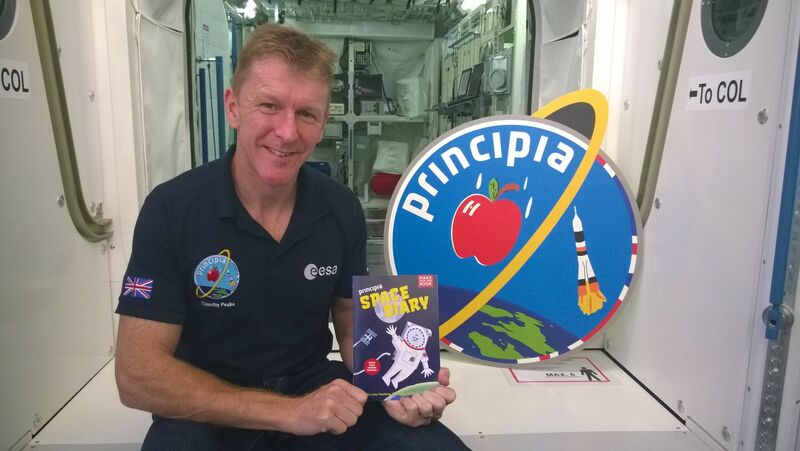 In 2015, we published the Principia Space Diary, a STEM-literacy programme that followed ESA Astronaut Tim Peake’s mission to the International Space Station. 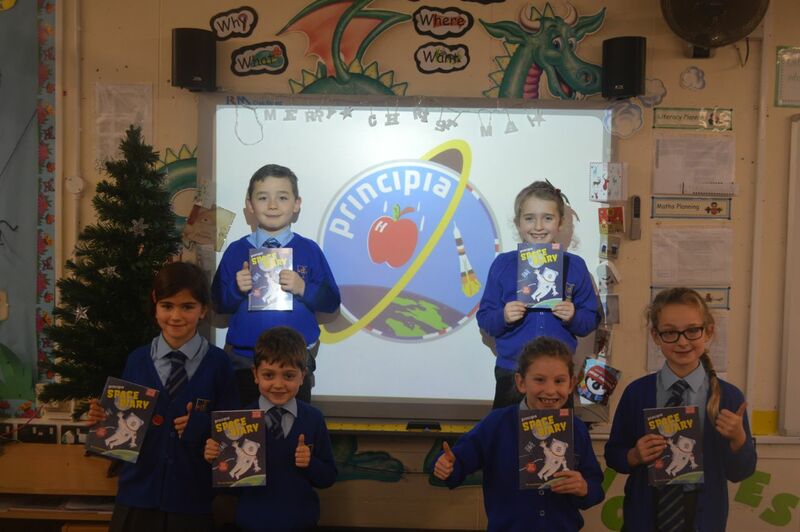 Our goal was to distribute 15,000 free books to children in the UK and with the support of the UK Space Agency we ended up distributing over 40,000 free books and having over 95,000 students register to participate online at principiaspacediary.org. We are proud to produce work that makes children part of the creative process and encourages them to form a positive relationship with books and science that will bolster them for a successful education. Curved House Kids was founded in 2013 by Kristen Harrison, a former Penguin editor and co-founder of Visual Verse online anthology. Kristen sits on the board of the International Visual Literacy Association. 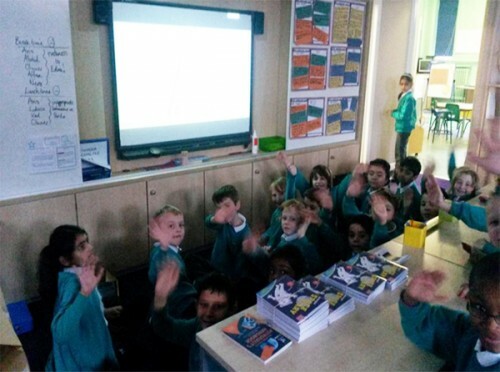 The European Space Education Resources Office, in the UK, aims to open doors for young people by supporting world-class teaching in STEM subjects, through the context of space. This is primarily achieved through bursary supported CPD, an online resource collection, and through our wider networks. ESERO-UK is part of STEM Learning Ltd. and funded by the European Space Agency and UK Space Agency. Earth Day has arrived! To help you celebrate, we’ve put together a list of our favourite Earth-related experiments and activities for your Earth Heroes. We can’t wait to see how you celebrate Earth Day. Don’t forget to use #EarthDay and #EarthHero on Facebook and Twitter, so we can see what you get up to! You don’t have to travel far to become an Earth Hero. Just take a wander through your backyard or nearby park to get started. Here are few activities involving plants, flowers and leaves found around your neighbourhood. The can encourage investigation, exploration, identification and analysis which can easily be adapted for different age levels. Discuss colours and shapes with younger children, and with older children utilise the internet and look up the names of plants you find and discover why they might be growing in your area. Which animals benefit from them? Getting children involved in gardening is a hands-on way to teach them about the lifecycle of plants. You don’t need a back yard to do this! There are loads of ways you can grow a garden inside using recyclables from your rubbish bin. Read this useful resource on how to garden indoors, if you get stuck! 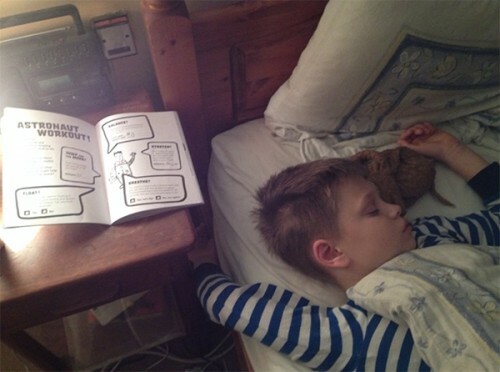 Got an aspiring David Attenborough in your household? Birds, butterflies and worms are three of the most common animals you’ll see looking out your windows. Why not make a bird or butterfly feeder and create a log of who comes to visit? Chart which birds or butterflies are the most frequent visitors. Note: If you can’t find any pinecones, use an apple. It’s biodegradable and good for birds! 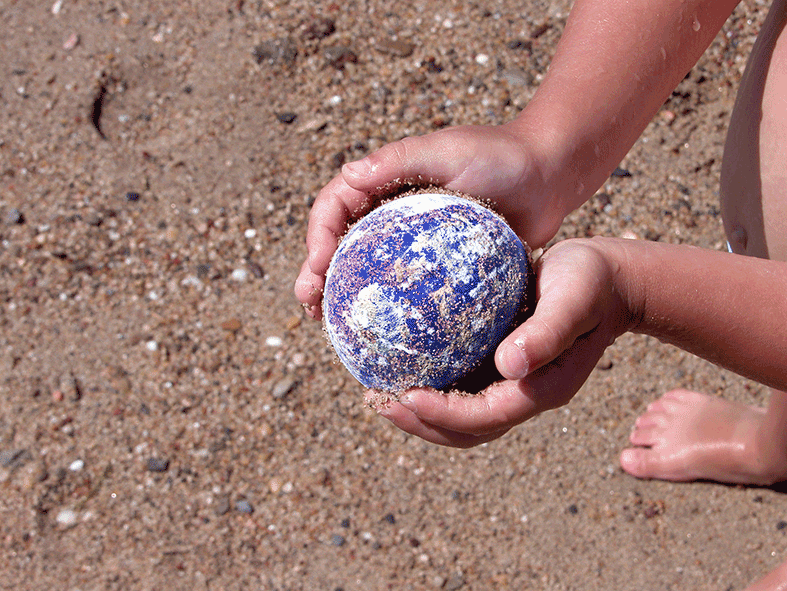 Earth Day is a good time to bring up important issues surrounding waste. Start a recycling box at home, sort through your wardrobes and toy boxes and donate old or unused items to charity. Here is some great information on how you can explain the importance of recycling and upcycling to kids. Recycle Now also has a fun, interactive game to teach kids about recycling. Play it here. Please remember that adult supervision is advised on all these activities. 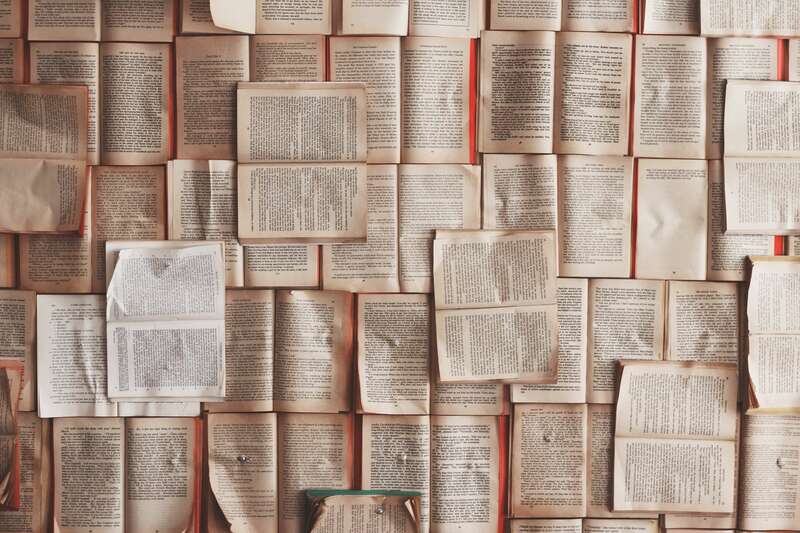 Valeria De La Vega talks about her experiences of growing up with Dyslexia in Colombia and how she overcame the challenges of this reading disorder. In the first grade I had an activity where we had to go around tables and read a paragraph out of a book. Once you finished it you could move on to the next one. I remember just staring at these pages and their illustrations and not being able to understand the words while my classmates passed by me on to the next table. So instead of trying I pretended to know what was going on and imitated what my friends did. 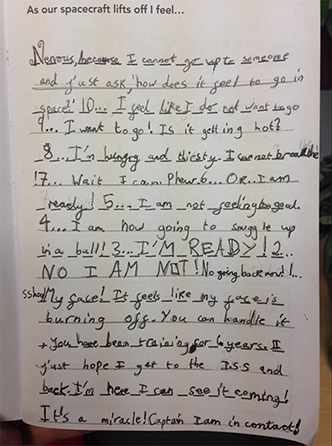 This sort of thing happened a lot in primary school. I didn’t participate much, I got nervous every time I had to read out loud and I loved going to the nurse’s office just because it would get me out of class. This is how my dyslexic brain works now when I have to read out loud, or better yet my thought process. Okay I can do this, I’ll just read it before so I don’t make a fool of myself. Starting now, alright these words I can read, I know them and this is going pretty smoothly, oh long word now, it’s okay I know it… continuing ugh made a little mistake with that one, back on track… oh no this next word I don’t know it I’ll read it a bit slowly but not too slow so people don’t notice it, oops said the wrong word, this time I said it right. Okay Vale keep up, I just stumbled on some other words and made up a word again but it’s okay it’s going alright and now it’s over, success. It’s not like I’m stumbling across every word I read, or that it takes me twice the amount of time to read out loud. Sometimes when I don’t recognise a word or if it’s too long I have to stop and sound out the letters. This leads to a slower reading time and in some cases mistakes because my brain doesn’t sound them out properly or it decides that it’s another word. This happens more frequently to me than to normal readers. Reading silently is something that I prefer, nobody is looking at me, I can read at my own pace and I make fewer mistakes because I feel no pressure. Unless it’s like when I was in school and I had to read in pairs. The other person would want to turn the page and I wasn’t at the end yet so I felt hurried, had to run through the sentences and not enjoy it at all. When I was younger I had trouble recognising letters, I would confuse b-d a-q-p c-o l-i r-t, and I would stumble more when reading. That lead me to ask more questions, a thing that is normal among children I think, but in my case curiosity was also accompanied by a break. Recognising letters wasn’t my only problem, once I solved that I still had other reading difficulties. For me reading was a tedious task and it took me longer to learn how to do it than it did to my classmates. 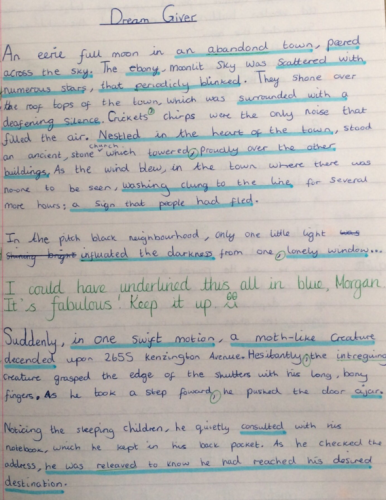 When having to read out loud in the classroom I would see which was the passage that I had to read before so I would do it just like my classmates did. This way I wouldn’t stumble or have the others read the word correctly on top of me if I took too long. I had a lot of help growing up, and I didn’t realise that I had a problem. I had to go to special-ed classes in school, do extra homework, went to after school tutorials and I even had reading classes during vacations. However, I think that there is an age where you don’t question why you have to do some things and you just do them because it’s part of a routine. Or you don’t really notice that you are struggling with some things because you just find it normal until it fades away. So when I had to do all of this I found it normal, unless I was lazy or I saw that my siblings were playing while I had to work, and that’s when it started to bother me. On the other hand, my mom always said I was special, but I thought she meant it as a quality I had because of my personality, while my sisters who were a bit older did know that I struggled. One of them loved to help me out, showed me different ways to succeed with creative ideas for school, and something about the way she explained things to me made it all more simple. There were various exercises that I had to do along the years that I had help. 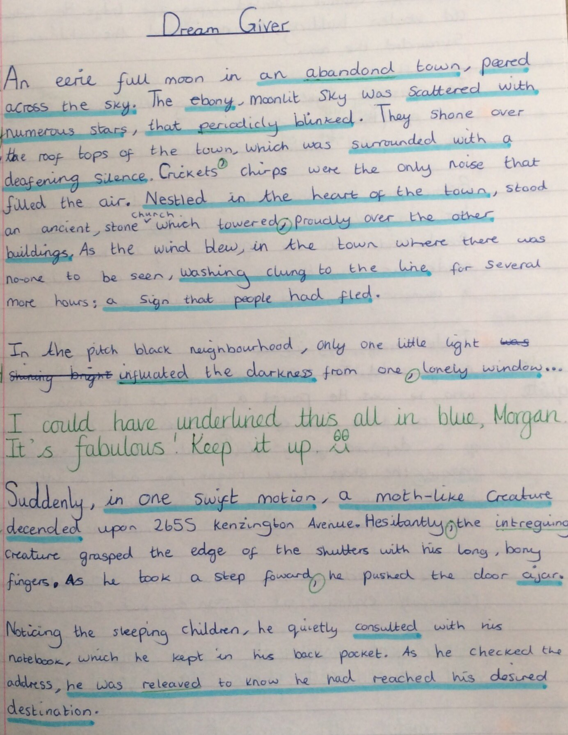 Sometimes my teacher and I read a text in unison, in other cases I would have to read a paragraph out loud and start again every time I made a mistake (an exercise that could be very frustrating). There were times when I did exercises with audio, for example writing down the lyrics of a song, listening to an audio and writing down the main idea or learning how to take notes from dictations or things I heard. There were other ones that had to do with identifying differences between letters and having to write them properly, as well as identifying different shapes and cataloguing them with colour. Images played an important role. With them I did exercises like cross matching vocabulary to pictures or describing what was happening in sequences that I saw. 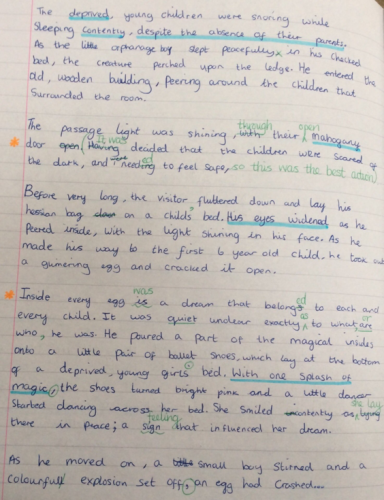 Since it wasn’t only about learning to read it was about comprehension as well I learned how to identify the main idea in a paragraph and its supporting ones as well. This was a process that took various years until I got a hang of it. Up until the third grade going to the nurse was a hobby for me to skip classes. Everyday I would say to my teachers that my stomach or my head hurt, of course they knew that it wasn’t true but off to the nurse I went. There she would make me have some tea and because of that I’ve developed a dislike for it now. In classes I would get easily distracted and just go to imaginary worlds. I loved story time when my teachers read out loud to us. So I wanted to be a writer, but when someone told me that in order to be a writer I had to read a book per week I thought that I couldn’t do it and I didn’t want to anymore. But little by little I started getting into books, stories became more captivating and all the extra work I had done was starting to pay off. 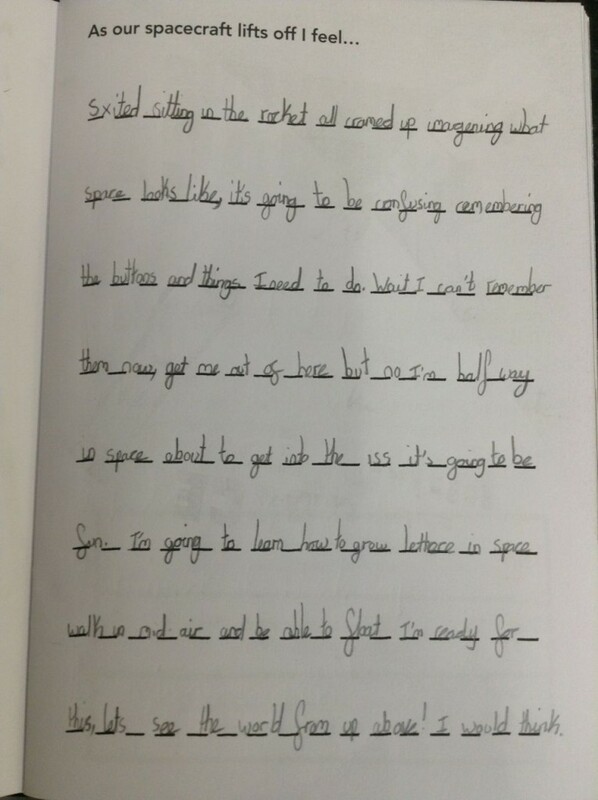 It wasn’t hard to read anymore. Some people think that dyslexic people are dumb and I can assure you we are not. Albert Einstein, Andy Warhol, John Lennon, Walt Disney and F. Scott Fitzgerald were all dyslexic and they were brilliant. Now I’m not saying that I’m anything like them, only that dyslexia doesn’t mean not being intelligent. I had a switch go on in my head when I finished primary school. I decided that I wanted to be one of the best and so I paid attention, I read, I studied hard and even graduated second best in my class. I think few people from my school know that I was dyslexic because it’s not something that I talk too much about or that showed after primary. In university I started studying Communications and I wanted to go into publishing. However, I was scared because spelling in Spanish wasn’t something that I had mastered. Even though it’s my first language I was always better at English because I preferred reading in this language and it doesn’t have accents like Spanish does. I took a copyediting class and had a talk with my professor and told her about my fears and her words encouraged me. She told me that she is also dyslexic and she is a great copy editor, so I said to myself well if she can do it so can I, and I did. Dyslexia can subtly affect you and lower your self esteem, it can make you shy and not want to shine and it can make you feel slow. Once you get a hang of it there is nothing you can’t do, your brain just works differently. I believe that there is nothing bad with that. It is something that I will always have and struggle a bit with but from my experience it won’t impair you to do what you want. I can read out loud but it’s something that if I can avoid it I will, on the other hand I love speaking in public, doing speeches and presentations. So it’s not a thing about stage fright, it’s about feeling confident in what I can do in front of others. If you know anybody with dyslexia it’s important to encourage them and not make them feel dumb. Since I can only talk about my experience and I got help when I was young I believe that the earlier you start getting help the better, but that shouldn’t stop you from trying if you are older. Visual learning is another way to get information through and I’ve found that it is very effective, words matter but so do images. A combination of both of these is a great approach towards learning for anybody, especially for dyslexic people who take longer to decode words, and you can get tired of working with letters again and again. Also, remember that every case is different and what worked for me could work differently for someone else and this is why it’s important to see what works out for each one and develop a strategy from that. I do believe that there have to be different approaches to reading. There should be books made that can engage those who have difficulties with them, and the earlier it starts the better. I’ve seen that there are typographers that have been developing typefaces (fonts) specially made for dyslexic people that make it easier for us to recognise each character, and I think this is wonderful. What in my opinion is a great approach for reading is to patiently give approachable stories to children and let them discover them little by little, encourage their own taste in reading in whichever genre they prefer, they’ll get where they need to get in their own time, but do help out. For example, I loved stories and when I read to my little brother I didn’t feel any pressure to get it right. Because he was three years younger than me, he enjoyed the stories as much as I did and we both loved the images that they had. Having this in mind get books that interact with kids, but also don’t forget that they are kids and need time to have fun, too much help can lead to rejection. I had great teachers that were caring and we took time out to play and cook so I enjoyed going to my extra classes. My mum celebrated my successes and I loved it, it made me feel encouraged, but she didn’t do this all my childhood which I think is great because I didn’t want to get great grades for a prize, I wanted to do it for myself. I now enjoy reading and want to work with books. I’m happy dyslexia didn’t ruin this for me but I’m also happy to be dyslexic because it helped me develop a different approach to reading and a passion for books. Valeria De La Vega just finished her undergraduate degree in Communications with an Emphasis in Publishing and Multimedia at Pontificia Universidad Javeriana in Bogotá, Colombia. She is currently working at the Corona Foundation a non-profit organisation that works towards education in Colombia. 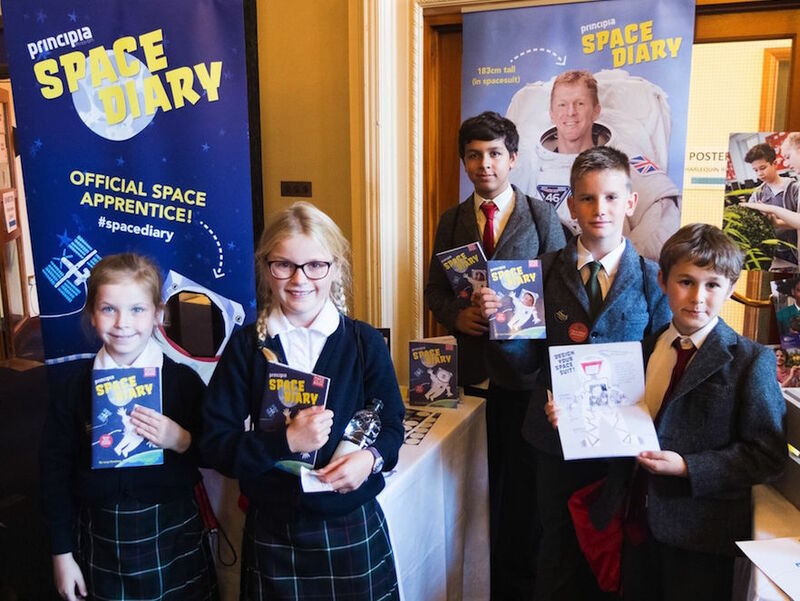 Students from Wellesley School show off their Space Diaries at the Principia Schools Conference in Portsmouth last month. “Tim Peake’s mission to space was an inspiration to so many and I am delighted we can offer a new set of primary school students the opportunity to draw upon his unique experiences and, in doing so, engage with STEM subjects at an early point in their education. 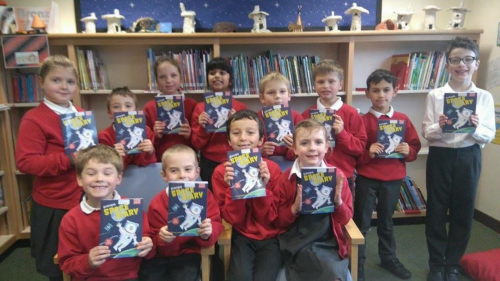 We are so proud to work with Tim again and I hope schools will enjoy the new Principia Space Diary,” says author Lucy Hawking. The new programme links to the curriculum for Primary Science, Maths, English, British Values, Computing (ICT), Spiritual, Moral, Social and Cultural development (SMSC), Design and Technology (DT) and includes exclusive coding activities from Code Club and Raspberry Pi, integration with the Zappar augmented reality app and a wealth of online resources. All lesson plans are differentiated for P1-5 (KS1 and KS2) for teachers in England, Wales, Scotland and Northern Ireland and extension activities provide extra challenges for those who need them. Teachers and homeschool parents in the UK can pre-register from 15 December 2016 in order to access the entire online programme for free when the materials are released on 30th January 2017. Access includes downloadable versions of the entire Space Diary book and curriculum-linked activities, differentiated teaching notes, lesson plans, extension activities and exclusive videos with experts including British astronaut Helen Sharman, Professor Stephen Hawking, TV presenter Dallas Campbell and astronomer Dr Sheila Kanani. Follow the conversation using #spacediary on Twitter and find out more about the Space Diary (http://principiaspacediary.org/). 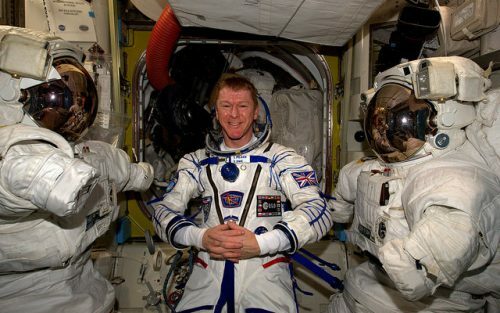 Tim Peake is heading off on his post-flight tour of the UK this month, visiting all four UK national capitals along with Leicester, Manchester, Salford and Glasgow. NASA astronaut and crewmate Tim Kopra will join Tim for the visits to Edinburgh, Belfast and London. Tim will be giving presentations at each city, giving his first-hand account about life onboard the ISS and talking about the important science experiments he conducted during his mission. As part of Tim’s Principia mission, the UK Space Agency has invested £3 million in the biggest education and outreach initiative ever undertaken for an ESA astronaut. 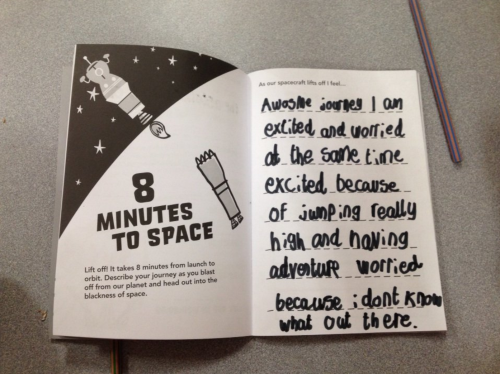 Over a million young people have taken part including over 60,000 UK school children that participated in our Space Diary programme! Find out further information on the venues and times here. Saturday 18th June is the big day when Tim Peake returns to Earth after six months on the International Space Station. Tim will return in a Soyuz capsule, along with crewmates Yuri Malenchenko and Tim Kopra. He’s due to land in Kazakhstan at 10.15am BST. Coverage starts at 4.00am BST on Saturday 18th June. Watch all the key events, from the time Tim enters to Soyuz capsule until he reaches Earth. 04:00 Farewell and hatch closing. Crew members will then change into their Sokul spacesuits. 06:15 Soyuz capsule undocks from the ISS. 09:15 Deorbit burn to place Soyuz capsule on its re-entry trajectory. 09:49 Soyuz capsule separates from the orbital module and the heat shield peels away layer by layer. 10:15 Soft Landing Engines are fired and the Soyuz capsule lands. On landing, the recovery team will help Tim and his crewmates from the capsule. The astronauts will then undergo medical checks. 12:45 Crew will fly in helicopters to Karaganda airport. 14:15-14:45 Crew arrives at Karaganda airport for a welcome ceremony, followed by a press conference. 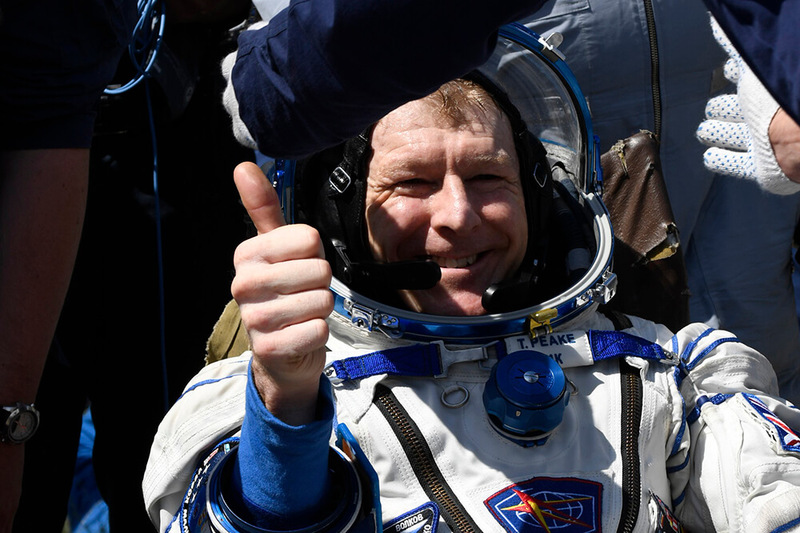 Celebrate Tim Peake’s return on Saturday June 18th at one of these exciting events! Having your own Landing Party? Good luck Tim, from Simonside School’s Space Diary Apprentices! 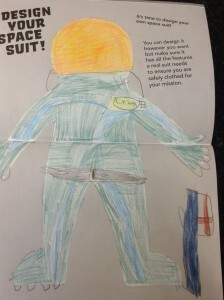 If you’re celebrating Tim Peake’s return we would love to see what you get up to! Send us your photos via Facebook, Twitter or Instagram and use the #spacediary to make sure we see them! You’ll appear in our Mission Feed alongside all the awesome schools who have been doing their Space Diaries and Principia-related activities. You can also email us at info@curvedhousekids.com. Remember to get parental/guardian permission before you post photos of your students. If you can’t get permissions we’d love to see pictures of their books! We recently built a drumming robot that’s smart enough to know how you’re playing the keyboard and can drum in time. 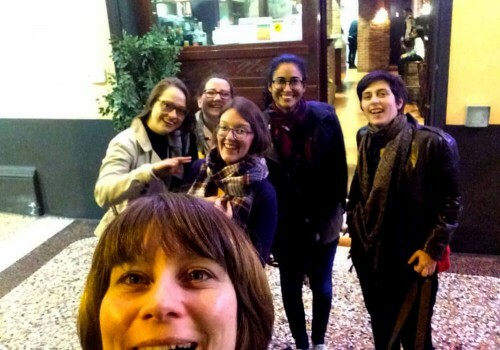 Curved House Kids goes to Bologna Book Fair! Going to Bologna I didn’t know what to expect. I knew of course children’s books and illustrators but I never imagined the magnitude of the fair. Before this I had only been in my country’s (Colombia) biggest fair — the Bogotá Book Fair (Filbo) — and in Canada I went to the Toronto Book Fair, both wonderful but very different in size and purpose. When Kristen and I arrived we immediately felt the joyful energy of this Italian city and were surprised to see how dog-friendly it is. As we walked through it, in less than an hour, we spotted 40 dogs. We knew that this was the place to be. 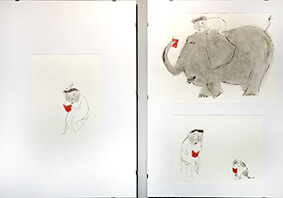 At the Bologna Children’s Book Fair, creative minds get to show their work and their enthusiasm for their craft. Walking through the stands, we viewed books that have been published all over the world. Where the fair began there were halls filled with the artworks of the selected illustrators, each of them with their own distinguishing style. Germany as the country of honour had a special hall exhibiting their illustrators. 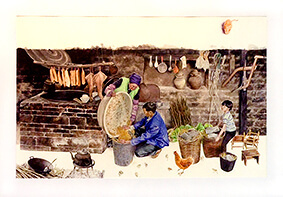 Work from this country demonstrated different techniques, from laser cut to fine drawings in black and white, or other illustrations filled with elements and a variety of colors. The fair was huge and I had never been in one of this scale. It had stands for every country; sometimes publishers from a same nationality shared one but in most cases they had their own. As we explored the hallways of the Latin American countries, Chile caught our attention. They produce wonderfully crafted books with talented illustrators, as well as great ideas. The most wonderful surprise was meeting Argentinian publisher Diego Bianki from Pequeño editor, who publishes from the heart and has won prizes at the fair this year and last. Talking to him we saw the passion he has for his craft, which is clear in his books like Tree Book Tree. This is an amazing book that can be planted and a tree will grow out of it. To promote it, he used the motto: books come from trees, today a tree comes from a book. 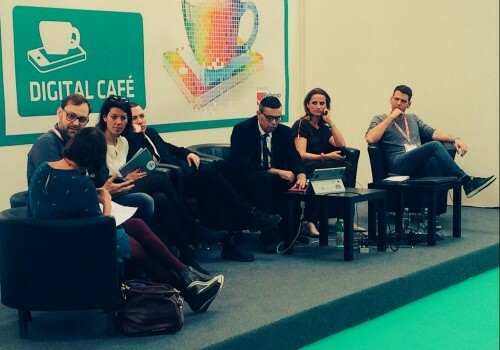 There were also panels about a variety of topics. We had the chance to listen to some about enriched books and interactive book apps, and how this market has to work to make business model strategies get attention for what they are doing. 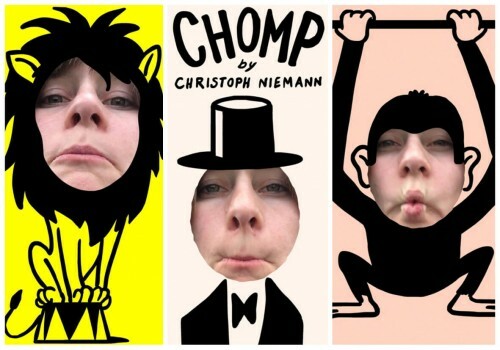 Now publishers are also creating books with augmented reality. This is a new concept of books that isn’t being used in Colombia but it is a worthy tool that we should be pursuing and discovering. Its possibilities are endless. The panels weren’t only about technology, and I was especially moved by one about refugees and children’s books. Panelists talked about how stories can help children understand why people leave their countries to live somewhere else and how this feels. It’s not just about understanding but about feeling and evoking emotion. This way real empathy is created and children can start building a better understanding with others. I left this panel with the feeling that these stories are needed all over the world and that they are helpful in all types of environments. After the panels, we met Verena Pausder from Fox and Sheep, and illustrator Christoph Niemann who had great ideas and advice for Kristen. I can’t end this blog without mentioning the lovely publishers from Ireland we met who adopted us into their group. They not only make amazing books and have creative initiatives, such as the book clinic, but also have such warm hearts and are very friendly. They truly made this trip to Bologna even better. Children’s Books Ireland, O’Brien Press and Little Island now have a special place in our hearts. Valeria De La Vega is a final year student at Pontificia Universidad Javeriana where she is studying Communications with an emphasis in Publishing. She is interning at the Curved House Kids to learn about publishing children’s books, help translate the books to Spanish and to assist with the development of visual literacy resources. I would love to boast that I was a prodigious childhood reader, ticking-off The Wind in the Willows aged 4. I was not that. I loved a good picture book, Katie Morag and the Tiresome Ted being one of the best. But when it came to attempting chapter books, I had no interest. I now wonder whether it simply came down to taste. I won’t blow my own trumpet and claim I just wasn’t being challenged – it felt very challenging! 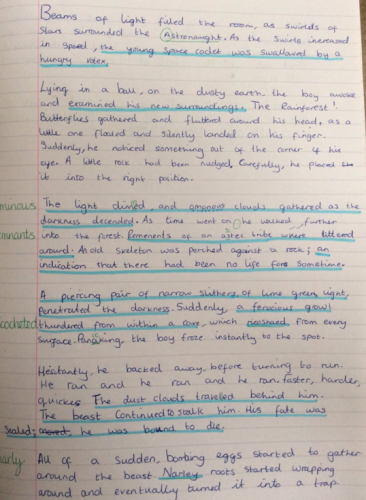 – but I felt very keenly the effect of being educated using strict reading levels. The alternatives, provided by my very well meaning Mum, were painfully fun, zany, and garish which was even worse. I could count on my fingers the number of books I finished between the ages of 6 and 12, outside of school. Written word purists might disapprove but audiobooks were what pulled me back in. The discovery of Stephen Fry’s rendition of Harry Potter and the fully dramatised (but unabridged!) production of Philip Pullman’s Northern Lights were completely magical. And suddenly I saw the point in reading again. One of the most important things I’m discovering at The Curved House is the universal importance of visual literacy. It’s becoming clearer that children learn and develop in completely different ways. This has encouraged me to reconsider my critical and self conscious attitude about the way I got into reading, that there is something wrong, or easy, about audiobooks. 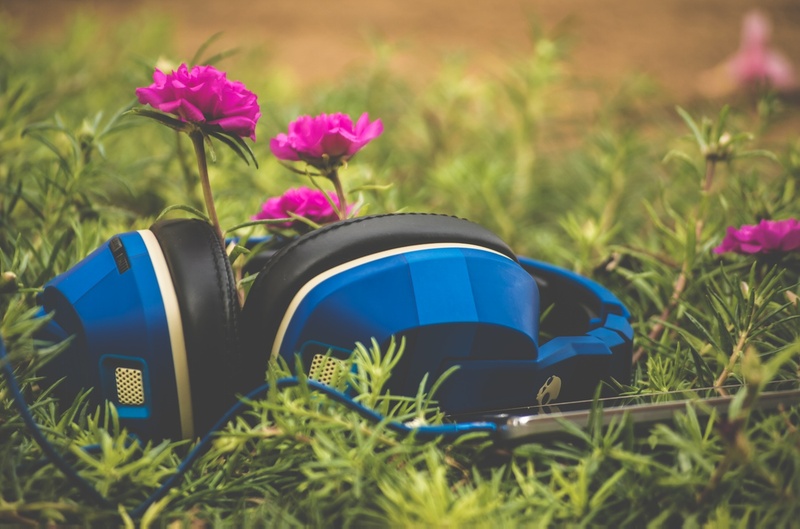 Audiobooks are an amazing format in themselves and they are also a potent gateway drug into the world of reading! For the uninitiated: I recommend anything Philip Pullman has ever recorded! 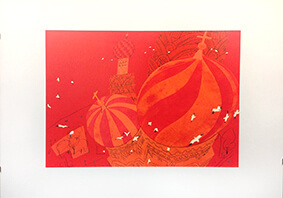 Rosie Cunningham is a graduate of MLitt Publishing Studies at the University of Stirling. During a condensed and highly productive four week work placement at The Curved House in Berlin, Rosie authored and project managed a Curved House Quick Guide, conducted extensive marketing and picture research, and assisted with editing and proofreading. She’s now returned to Edinburgh to work for Picture Hooks Illustration Agency to pursue her career in other areas of publishing. We wish her all the best! Never let anyone tell you that you aren't good enough or smart enough to do what you want. Add Space to your Science Week! 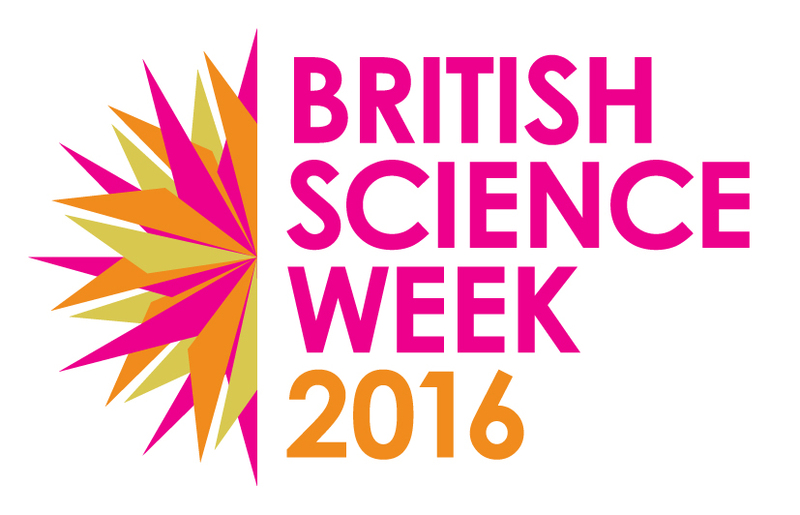 British Science Week has arrived! To help you celebrate, we’ve put together a list of our favourite space-related experiments for your Space Apprentices. We can’t wait to see how you celebrate Science Week. Don’t forget to use #spacediary on Facebook and Twitter, so your photos appear on our Mission Feed. This activity will need some adult supervision to assist with cutting and construction. Chapter 3 of the Space Diary explores things Tim Peake might see from the ISS. He has a very special view of space! From Earth, we can’t see the things in our solar system quite as well, especially if we live in the city. Depending on where you live, you might be able to see the constellation called Ursa Major, also known as the ‘Big Dipper’, if the sky is very dark. This is where a galaxy called the Pinwheel Galaxy is. But you can build your own Pinwheel Galaxy pinwheel, with the help of NASA. You’ll need a colour copy of the Pinwheel Galaxy printout (available here), a pipe cleaner, some wooden chopsticks or a popsicle stick, some scissors and a hole punch. For detailed instructions on how to make your Pinwheel Galaxy pinwheel, head here. 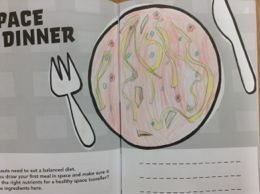 This activity is more suitable for older children. It will need adult assistance and supervision, and requires some items which you may not have at home or school. To get an astronaut safely into space, it takes a big team of clever engineers to design and build a spacecraft, and an even bigger team to co-ordinate blast-off. If you watch the launch of Tim’s Principia Mission, you can see the power needed to shoot a heavy spacecraft through Earth’s atmosphere and into outer space. Watch a clip of Tim’s launch below. You can build and launch your own spacecraft, with the help of an adult. There might be a few things – like a film canister and antacid tablets – which you don’t have at home or school, so make sure you talk to an adult or teacher beforehand to help you plan your activity. Details of how to build and launch your own Bubble-Powered Rocket ship are on the NASA website here. Younger children will need some assistance with this experiment. It can be messy, so make sure your Space Apprentices have an appropriate place to work! Planetary geology is an important space science. Geologists examine the structures and surfaces of planets, their volcanoes, moons and the impact of craters on them. Geologists study samples collected during space missions, as well as meteorites that have fallen to Earth, to learn more about the planets in our solar system. While there are lots of planets in our solar system with volcanoes, astrogeologists are particularly interested in those with active volcanoes, since this is something those planets have in common with Earth. The moons of Jupiter, Saturn and Neptune all have active volcanoes. You can make your own volcano with everyday items you have at home. Ask an adult to help you create your very own space volcano, by following the instructions here. Adult supervision is important for this experiment, because it uses boiling water. Space Apprentices who have researched our solar system will know that the weather on other planets is very different to the weather on Earth. Some planets have extreme solar winds; others have dust storms and hurricanes. Some planets – like Venus – have a thick layer of cloud, which traps heat and creates a greenhouse effect. You can make your own cloud in a jar with just a few household items. You will need to use hot water in this activity, so it’s important that an adult helps you. By making your own cloud, you can witness firsthand what happens to water as it heats and cools. Next time you look up and the sky and see dark grey rain clouds or fluffy white ones, you’ll be able to tell your friends what’s going on above your head! To learn how to make a cloud, follow the instructions here. Younger children will need some help with this experiment, and all young scientists will need a space where they can make some mess with paint and soil. Biologists are essential when it comes to space research. Not only do they look at what happens to the human body in space, they also study what happens to plants. This is important because scientists are investigating growing food in space. There are lots of different challenges associated with growing food in space, because of the lack of soil, direct light, oxygen and gravity. You can explore what happens to plants when their light source is restricted, using a fun phototropism experiment. Plan ahead, because you need to paint some cardboard and wait for it to dry before you can go to the next step. You might like to build your experiment over a few days. To build your phototropism experiment, click here. Space Apprentices Reach the Halfway Mark! When we first heard that we were amongst the schools selected to take part in the Rocket Science RHS for Gardening Campaign, to grow seeds that have been orbiting the Earth for six months, we were really excited and told our local newspaper about it. 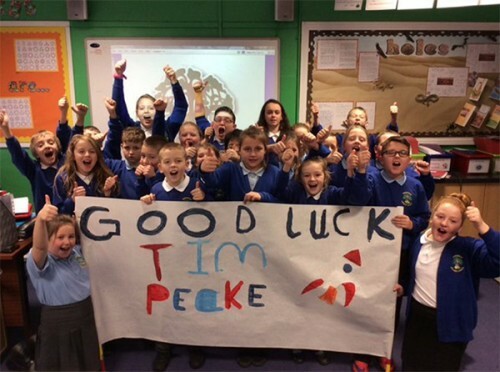 We even received a tweet from Tim Peake! We did watch Tim’s rocket launch and felt for him flying out into space. Everyone was glad he made it ok. While waiting for the seeds to be sent to us, we got busy with our space apprenticeship through the Curved House Kids Space Diaries. 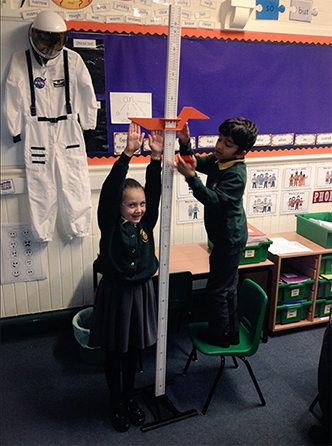 We have explored how tall we would grow in space, how it would feel to float in microgravity and we have learnt to say ‘hello’ in four different languages! 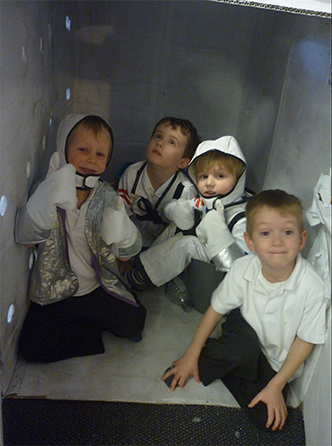 It was fun creating our own spacesuit, especially as most of us made sure there was a ‘nappy’ involved! Breaking the code was a tricky one but our helpful grown-ups gave us some clues, so we could decode Mrs Peake’s message finally. It has been exciting learning about the planets and their special features. It seems like a good idea to take an umbrella to Neptune – if we ever get there! We have also created our own ISS and Soyuz rockets and imagined ourselves flying out into space. Now that Scott Kelly has brought the rocket seeds back to Earth, preparations have begun at the gardening club for the great experiment. 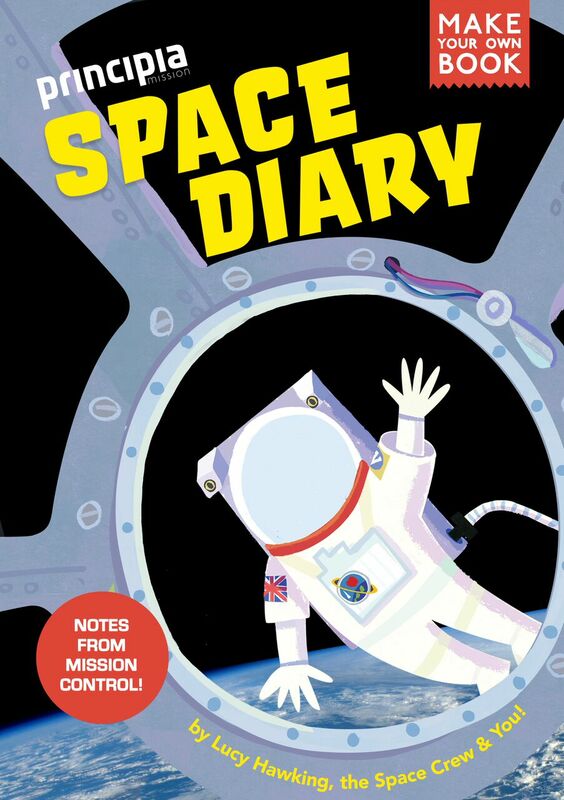 Halfway through the Space Diary, we are really looking forward to learning more about space and the life of an astronaut. Our space apprenticeship has been fun so far! I had the great honour to be there in Kazakhstan for launch – a real once-in-a-lifetime experience.